Cusano 18 M1 BundlesThere are 5 products. The M1 by Cusano is blended to match the taste and quality of the famous Macanudo brand, featuring a Connecticut wrapper and Dominican fillers. Handmade Cusano M1 cigars are mild, sweet and creamy cigars with a Connecticut shade wrapper and Dominican fillers and binder. Cusano M1 are among the best Dominican cigars you’ll find in a bundle. They’re known for their excellent construction, long gray ash, good flavor and easy draw. 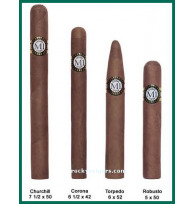 Cusano M1 cigars are smooth, not at all overpowering and are currently available in five sizes: The Cusano M1 Cafe robusto, the Cusano M1 Corona, the Cusano M1 Robusto, the Cusano M1 Torpedo, the Cusano M1 Churchill.The advantage of smoking the M1 is saving money! Value brands like this one make the smoker anf his wallet smile. Its well made and well priced. This mild everyday cigar is available in bundles of 20.